A month ago, I blogged about Jose Bautista's awful April, and asked what went wrong and whether it was reasonable to expect a rebound. You can click on the link for the full details, but I concluded with this reasonably optimistic sentence: "For what it's worth, this looks to me like a problem with discipline and patience - something that Bautista has been shown to have in spades." May Bautista will smash April Bautista. Or wants to fly like an eagle. It's probably a bit unfair and not entirely telling to compare April and May in order to see whether I was right - I'm comparing one rather small sample to another, after all - but let's look anyway. So, how did Bautista fare in May as compared to April? It's not even close, actually. In April, Bautista was a replacement-level hitter; in May, he was a star. His 143 wRC+ makes him the 35th best hitter in MLB over the course of that month, and on the season he's a respectable 60th out of 160 qualified batters. Interestingly, too, his numbers in May are right around what was being predicted for him by the major forecasting systems in 2011, following his first monster year in 2010. So, the power has come back - Bautista belted 9 homers in May, tying him with Edwin Encarnacion for 8th most - as you can see from his Isolated Power number being almost exactly what it was in 2011. And his BABIP is much closer to what it was in 2010, which accounts for why the batting average is around his career mark and not his 2011 number. There are still two worrisome numbers, though - his walk-rate, while still good, has absolutely cratered. But Bautista hasn't walked as little as he did in May since his second season in MLB, which makes me think it's a bit of a fluke. And his K-rate has risen to above career-average territory, which is all the more surprising because it has been around 17% for the last two years. But, really, that's only a difference of 4 strike-outs over the course of a month. The higher May BABIP seems to be a result of more line-drives; the fact that it's still rather low, though, would seem to be explained by the fact that he's still hitting infield flies at an alarming rate. Last time, I suggested that the problem, here, might be that he's not quite getting around fast enough on high fastballs. That might still be a problem - though less of one, obviously, because the home run-rate is back to last year's level. Here's where we start to find an explanation for these numbers, too. Bautista is seeing fewer fastballs, but hitting them much better than he was before. (Not nearly as well as the last two years, mind you, but back into 'excellent fastball hitter' territory.) He's also seeing more curveballs, cutters, and change-ups. This has me wondering if the pitch-selection in April suffered from some sort of selection-bias - if the Jays were simply seeing a lot of pitchers who through a lot of fastballs. Because you would think that Bautista's struggles in April, and the recent development of batting Encarnacion behind him, would lead to more fastballs, not fewer. And now we're back to the zone and contact numbers - which, I'll remind everyone, stabilize a lot faster than any of the other stats we've looked at. Amazingly, while Bautista is striking out twice as much and walking much less than in April, he's also seeing fewer pitches in the strike-zone and swinging less often - he's back near his norm from the last two years, actually. And his contact rate has actually gone up. Those are really strange numbers to see in combination, and I can only assume that he's seen a really abnormal number of called third-strikes. The O-Swing number have, unfortunately, not changed a bit. And the Z-Swing number has barely changed. So, while pitchers have clearly approached him differently in May, Bautista hasn't actually changed his approach. The difference, though, seems to be in his contact-rates - he's missing more often on outside pitches (which is a good thing) and making contact more often on strikes (which is also a good thing). What's unclear, though, is whether those contact rates are the result of April's bad luck regressing to the mean or the result of Bautista doing something differently. So, the end result is this: in May, pitchers returned to pitching Bautista like they did last year, and they've paid for it. Bautista continues to swing much like he did in April, but both his O- and Z-Contact rates have swung dramatically in his favour. 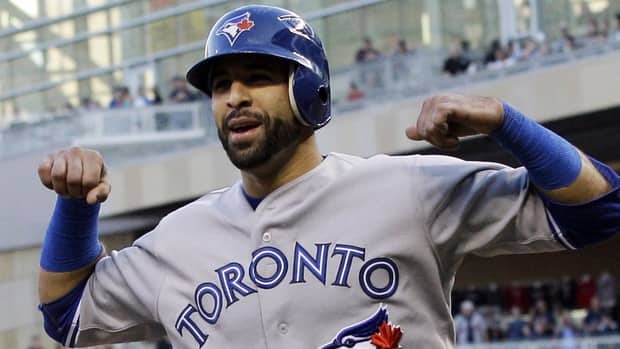 On the plus-side: Given his history - and the fact that May aligns far better with his 2010-11 numbers than does April - it would seem to me that the May Bautista is the one we'd expect to see the rest of the way. On the minus-side: His swing and contact profile, while improved, still look markedly different from 2010-11. (Well, they look somewhat like 2010, but not much like 2011.) It's looking increasingly likely that that Bautista won't re-emerge.